A blog reader, thank you!, sent me a 2007 study on IgE written by an Italian research team. The full study is available here: http://tinyurl.com/4do9nx. Intriguing, I must say. As a myeloma patient, you tend to read mostly about IgG (my type of myeloma), IgA and IgM…but not much about the other immunoglobulins. I looked up IgE and found that it triggers our body’s response to allergens such as cat dander, dust mites and pollen, and it also protects us from parasitic worms. IgE levels are connected to survival? Well, well. Let’s keep reading. The Italian researchers checked IgE levels in a large number of myeloma patients and MGUS folks and compared the results to a control group in order to determine survival and prognostic factors. They found that IgE levels progressively decreased from controls to MGUS and from MGUS to MM. And patients with high IgE levels lived 2 to 3 years longer than those with low or intermediate levels. They concluded that high IgE levels are positive predictors of overall survival (P = 0.03 and 0.08,respectively) and strongly correlated with hemoglobin values. Problem is, though, that total IgE levels are highly variable in general population, depending on many factors, such as age, gender, race, atopy, genetics, immune status, season of the year, tobacco smoke, and concomitant diseases. Further on we read that the Ranges of normal IgE levels are very variable, and no consensus among laboratories has been reached to define normal and pathologic values. Okay, so that could be a reason why IgE has not been taken into consideration in myeloma patients…until now, at any rate. Another interesting finding: IgE is connected to haemoglobin (Hb) and Beta-2 microglobulin (B2M) levels. The researchers found that a high IgE meant a higher Hb and a lower B2M, and this in turn meant a better prognosisl. In the Discussion part we find the following titbit: The positive association between IgE levels and survival can be interpreted as an indication that (a) the immune system of MM patients with higher IgE levels is less deteriorated […]. Ah. At any rate, because IgE is an antibody connected to allergy response, the possibility that myeloma patients with allergies such as asthma would be more protected than others in terms of disease progression really (!) got my attention since I suffer periodically from bad attacks of asthma (these attacks have returned, by the way, but I think it’s just because of the change in season from hot to chilly) and other allergic reactions. Hmmm, I thought for a second, have I finally discovered something positive about having asthma and rosacea??? Unfortunately, my hopes were dashed when I read that it is unlikely that allergies play a protective role in myeloma. Bummer! This study is particularly interesting because for the first time ever a group of researchers has found a connection between IgE levels and survival prognosis. The higher those levels, the better off you are. I wonder if I could have my IgE levels tested…just out of curiosity. Or…on second thought…do I really want to know…??? I read a fascinating article yesterday in Science Daily (http://tinyurl.com/449vm3) about curcumin’s ability to reduce the size of blood clots. Curcumin may reduce the size of a hemorrhagic stroke, say Medical College of Georgia researchers. They are using animal models to study curcumin’s effect on intracerebral hemorrhages, bleeding in the brain caused by ruptured vessels. Last August, while Stefano and I were driving around Burgundy, France, we listened to all sorts of music. We don’t have the same taste in music so this wasn’t an easy task at times, but we do agree on Ligabue, a well-known Italian rock star. So Ligabue became our France 2008 soundtrack (together with Mozart when we wanted something quieter…). To be better than the one that has already gone by. I want to enjoy [life] as long as possible. I will have access to a computer at my parents’ house, so I will be posting whenever possible, mostly when I am not getting clobbered at Scrabble…my sister and niece are ferocious Scrabble players (I have no idea why they won’t let me play in Italian…eh!). Yes, I admit, I can’t wait to leave. Even though I just recently found out that the Myeloma Patient and Family Seminar organized by the Associazione Mario Schirinzi and the International Myeloma Foundation will be held in Prato, near Florence, on Saturday October 18th…and, can you believe it???!! !, I return to Italy on the 19th. This means that I will MISS the seminar by just one day. Just ONE day!!! 😯 And I can’t change my el cheapo plane ticket. Too bad! I had been very much looking forward to attending this seminar…among others, Dr. Boccadoro and Dr. Durie will be speaking, and Suzie Novis will be there…oh bummer bummer bummer! Okay, no more whining, I promise. If you live in or near Tuscany and would be interested in attending, though, please see the website Mieloma Help for more information (I have a link to it on the right-hand side of my homepage). Or write to me privately, or leave me a comment, or (!) fill out my (new) Contact form (also on the right-hand side of my homepage). Vittorio sent me the programme, which I would be glad to forward upon request. In order to read the article, I had to sign up (for free) for “The Scientist” (http://www.the-scientist.com/). I then read the entire article. Ah no, “shocking” just doesn’t cover it. The article begins as follows: Some breast cancer researchers may be studying the wrong type of cancer. A growing body of evidence suggests a cell line that’s been a cornerstone of metastatic breast cancer research over the last 25 years is in fact derived from melanoma cells. Say…whaaat?! In 2000, a Georgetown University Ph.D. student, James Rae, wrote a paper on gene expression in 60 human cancer cell lines, including the purported breast cancer cell line, known as MDA-MB-435, which he placed with melanoma cell lines, not with breast cancer ones. It’s a long story…what follows are a few highlights. The question arises: is this case unique? Apparently not. According to “The Scientist” report, Misidentification of cell lines is not rare; a short tandem repeat analysis of 100 human cell lines last year found 18 of the lines were incorrectly designated. But with 435, misidentification may be especially problematic. Because of the cell line’s unrivaled metastatic ability in mice, more than 650 studies using 435 as a breast cancer model have been published (including more than 60 so far this year). Despite growing doubts about its identity, with nothing to replace the model line, researchers have been unwilling to let it go. “There are people vested in using the cell line because they have grants involved,” said Rae. Well, there seems to be a “simple” solution to this problem, suggested by Prof. Rae himself, a breast cancer researcher: “The efforts spent over the years on studying MDA-MB-435 have not been wasted,” he wrote in the conclusion of his 2006 analysis of 435. “The many studies published using MDA-MB-435 as a model for breast cancer could now conceivably be reinterpreted as studies using M14 as a model for melanoma.” You can read the abstract of a study Prof. Rae et al wrote in 2007 here: http://tinyurl.com/48do7h Here it is clearly stated that this particular cell line can no longer be considered a model of breast cancer. But it can be used as a valuable new resource for the melanoma research community. Aha! There you go! Administer breast cancer drugs (based on MDA-MB-435 testing) to melanoma patients…! I have a million questions but no time to search the Internet to find any answers right now. One of my questions: who is responsible for investigating such issues? What the… is the FDA doing about this? What about Congressional oversight? And why hasn’t this story been picked up by the popular press (I did a quick search, found zilch…)???!!! I would like to end by quoting Dr. Moss: We are constantly being reminded that this is the era of evidence-based medicine. But if the very cell lines which have provided the foundation for breast cancer research for the past quarter century have now been conclusively shown to be melanoma cells, not breast cancer, how solid or trustworthy is the evidence on which current breast cancer treatment is based? Evidence built on such flawed foundations more closely resembles hearsay than science. Coincidentally, Fanatic Cook wrote an excellent post concerning the main two U.S. presidential candidates’ stance on healthcare: http://fanaticcook.blogspot.com/2008/09/obama-and-mccain-on-healthcare.html. A blog reader/myeloma patient/friend, thank you!, sent me the following (it’s going around Internet). Once you have read it, I guess there will be no question as to where I stand! If your name is Barack, you’re a radical, unpatriotic Muslim. If you cheated on your first wife with a rich heiress, left your disfigured wife and married heiress Cindy the next month, you’re a Christian. If your husband is nicknamed “First Dude”, with at least one DWI conviction, who didn’t register to vote until age 25 and once was a member of a group that advocated the secession of Alaska from the USA, your family is admirable. This morning I had a ton of errands to run, including a trip to the pharmacy. While standing in line, I was approached by an employee promoting some propolis-based products. I was feeling a bit tired and, frankly, in no mood to hear a sales pitch. So I made polite excuses, and she withdrew. Well, almost immediately I felt like a total jerk, remembering that I used to be a fundraiser (worst job of my life) and realizing that it wouldn’t hurt me that much to have a look at this stuff, so I crossed the room to speak to her. I ended up buying a propolis cough syrup…no, I don’t have a cough, but it’s always good to have something like that in the medicine cabinet. Besides, I had to buy SOMETHING. Encouraged by my interest, she began describing other, similar products to me. These throat drops, she explained, stimulate our immune system in order for us to be in better shape at the beginning of the flu season. It was out before I could stop it: oh, no, I can’t take anything that stimulates the immune system. I have multiple myeloma. She looked at me blankly and said: ah, I see. But I could tell that, in fact, she could not “see” at all. She had no idea what myeloma was, but figured that it probably wasn’t a good thing. She didn’t ask me for an explanation, so I didn’t offer one. Those four words, ho il mieloma multiplo, ended our chat. A blog reader, thank you! ; sent me a very amusing video earlier today…here is the YouTube link: http://tinyurl.com/58jf2w. Have a look, especially if you love dogs. Funny thing: no matter how hard I dug into my memory, I couldn’t figure out WHERE exactly the movie had been filmed. The village looked sooo different. It’s also true that I haven’t seen “Chocolat” in years, which certainly didn’t help my trip down memory lane. Anyway, after finding the tourist office closed and walking up and down and through and around Flavigny several times, we finally gave up on finding exact “Chocolat” locations and just took photos. 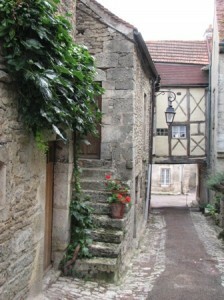 These photos remind me of something that I absolutely adored about Burgundy: even houses that were little more than piles of rubble (not these, mind you!) were surrounded and decorated by flowers. 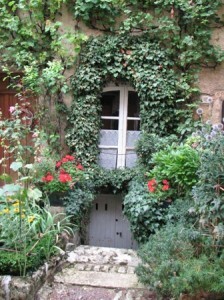 There were tidy gardens and plants and flowers everywhere. So cheerful. So lovely. Okay, I am procrastinating. I have to go! Ciao! And take care, everyone! P.S. And speaking of photos…I like to change my blog header now and again. The current header is a view of the hills near my house in Florence. And yes, I take all my header photos.